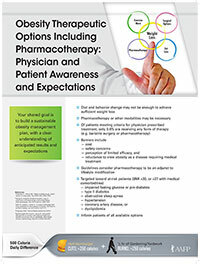 Below you will find the educational information presented during the IDEAL® CME/CE activity at AAFP, held on Ocotber 22-25, 2014 in Washington, DC – One Size Does Not Fit All: Developing a Collaborative Care Plan with Your Patient to Reduce Obesity and Improve Outcomes. This material is provided for your information only. CME/CE credit was offered for participating during the live event only. True or False. 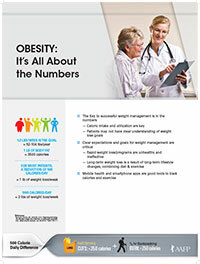 Patients should be encouraged to jump start weight reduction plans by utilizing quick loss diets, followed by transition to a more reasonable weight loss approach. True or False. 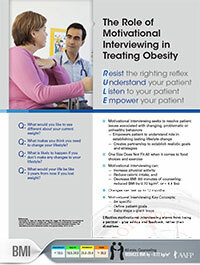 Motivational Interviewing is a therapeutic intervention study aimed at establishing a direct line of information and guidance from the clinician/expert to the patient to increase compliance to lifestyle changes. Of patients who meet the criteria for pharmacotherapy for treatment of obesity, consisting of a body mass index of > 30 or a BMI of >27 with comorbidities, what percentage are currently receiving pharmacotherapy or surgical intervention? True or False. 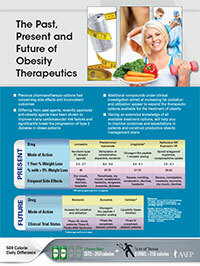 Clinical studies of novel anti-obesity pharmacotherapy demonstrated > 10% body weight loss results over a 1 year period. 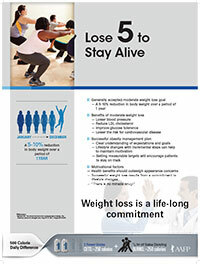 Which of the following comorbidities can benefit from as little as a 5% reduction of body weight? Supported in part by a grant to the AAFP from Novo Nordisk and Takeda Pharmaceuticals. IDEAL®technology for this activity is provided by Educational Awareness Solutions.